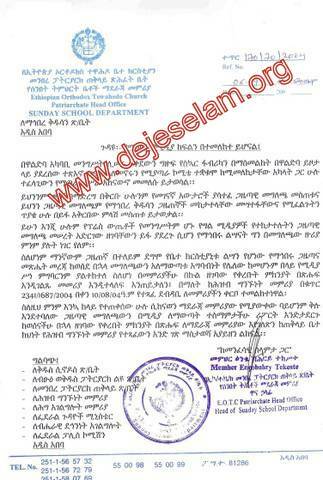 በጠቅላላው ሪፖርቱ አዲስ የውይይት በር ከመክፈት በስተቀር የተከፈተውን የተቃውሞ እና የውይይት በር የሚዘጋ እና እልባት የሚሰጥ ሊሆን አይችልም። ተቃውሞውም ይቀጥላል፤ ውይይቱም ይቀጥላል። አጭሩ መፍትሔ መንግሥት የጀመረውን ነገር ማቆም ብቻ ነው። ይዋል ይደር እንጂ መቆሙ ግን አይቀርም። ያለ ሕዝብ ተቀባይነት የሚጀመር ነገር መጨረሻው ምን እንሆነ በታሪክ እናውቃለን፤ በአገራችንም አይተነዋል። ደርግ መንደር ምሥረታ አለ፣ ልማት አለ፣ ገበሬውን ሰበሰበ … ለውድቀቱ ምክንያት ሆነ፣ መንደሩም ተበተነ፣ ልማቱም እንደቆመ ቀረ። ይኼኛውስ ምን የተለየ ያደርገዋል? The report is up to our expectation. Only God and the study team know the truth. We may not hear about Waldeba any more except the intervention of God's mighty hand. Men yaderegu, chegerun kemetekom belay lela men malet yechelalu? Manes yesemachewal. Gize yefetaw. Amlake Kidusan ersu serawen yesera. lenegeru balebetun kedewet yele, min yedenkal. Aye Aba Paulos Egeziabher yeyelewot, letsedk abenet honew limerun sigeba enkefat honuben. 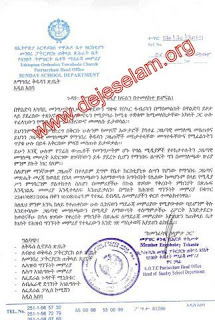 Amlake Tekelhaimanot lebunawoten yemeleselewot. Gen seweranu yegedamatuena yekedusat mekanatu tebakewoch yet hedu? Hulum tewen malet new? Bewenu mekeberiya ena mekebera mekan, mekari wemegesets yehone abat yemaygegnebet zemen lay deresen malet new. Enkyas ho belo weteto memot yeshalenal, men albat alemotenem kalen. Well done Mk, it seems there was a comunication break down b/n the gov and the the church fathers at the walidba.From what i read is the bigger problem is the issue b/n the fathers at the walidba that creats a bigger information breakdown,one says it's ok the other say's no. so if you ask me the problem is in those fathers that is self centered,have their own agenda. The bigger issue is our church fathers preach we are 1 GOD creation but in their deeds they are separated by tribe what a shame. Mahbere Kidusan’s report is good but the conclusion is not appropriate. Even the monks and nuns in Waldba do not have the authority to suggest an exchange of 16.6 hectares of blessed land (blessed and trodden by the Christ and His Mother our Queen the Blessed Virgin Mary). Waldba is God’s own real-estate; not man’s. The report is also a little short on the environmental and urbanization threats Waldba encounters as a result of this invasion. It is, however, understandable that Mahber Kidusan is in an extremely difficult situation to report beyond what it already has given it is under such immense threats from the EPRDF. They are called after 'kidusan' to be martyrs, to be persecuted, to be jailed, to be burned, ETC.... They have to only speak the truth, not to be diplomatic or politically correct. If they fear those who can jail or kill them, they should change their name. 'kidusan ' were not and are not smart Christians. They did not pretend to have been conservative Christians, but lived Christianity enduring all trials and tribulations they faced. MK is hero against Begashaw, so called 'tehadiso' and those who commented against its wrong doings and suggested the way forward regarding its mission??? If you fear you have to pave the way for others who are ready to be martyrs to their Church and to their religion. But, in my judgment, it not only fears rather your under cover loyalty to the 'government' in the palace is implied in your response. You are trying to play a game; but Christianity is not a game. You either live it or leave it! እግዚአብሔር አምላክ ለቤተክህነቱም፥ ለቤተ መንግስቱም ልቦና ይስጥልን። ቅዱሳት መካናትን ሁሉ ይጠብቅልን። አጽራረ ቤተክርስቲያንን ያስታግስልን። አሜን! We done MK I am always proud of you, but the conclusion should not even cosidered with Waldba holy land. All we wanted is the truth. The rest is leave it to people. We will fight to our death no matter what is the outcome. better to think twice before going a head but I appreciate also ur dedications!! God reveal himself through men. We need people who stand for the truth. As we all know Mahbere kidusan claim that it stands to defend the EOC and this is the time to speak out their mind with all expected harassment, torture, and intimidations. That’s what makes them different from ordinary citizen. We all have sympathy to waldiba and our country in general. The advantage of being organized is to defend yours and others right. This is the time mahberkidusan to be tested. Get lesson from our Muslim brothers.